There are numerous bus services arriving into and departing out of Madrid Airport. Passengers will find bus stops in the Arrivals and Departures areas of all terminals. EMT Madrid (www.emtmadrid.es) runs regular bus services between Madrid Airport and Madrid Avenida de America bus station (central Madrid), RENFE Atocha mainline railway station (stops at Terminals 1, 2 and 4 Arrivals) and Pueblo de Barajas (stops at Terminals 1, 2 and 3). CTM Madrid (www.ctm-madrid.es) runs regular bus services between Madrid Airport and nearby underground station, University, Madrid fairground (stops at Terminal 4) and San Fernando de Henares and Torrejon de Ardoz (stops at Terminals 1, 2 and 3). Avanza (www.avanzabus.com) runs regular long distance services between Madrid Airport and Salamanca (stops at Terminals 1, 2 and 3). Alsa (www.alsa.es) runs regular long distance services between Madrid Airport and many major Spanish cities such as Zaragoza, Barcelona, Valladolid, Leon, Coruna, Santiago de Compostela, San Sebastian, Bilbao, Santander, Pamplona and Granada (stops at Terminal 4). There are large taxi ranks located outside each terminal building in the Arrivals areas. Madrid Airport has its own underground stations at Terminal 4 (access via Level -1) and Terminal 2 (access via centre of 1st Floor). More information is available on www.metromadrid.es. The underground service connects Madrid Airport to the centre of the city as well as connecting Terminals 1, 2 and 3 to Terminal 4 and mainline stations Principe Pio and Atocha. 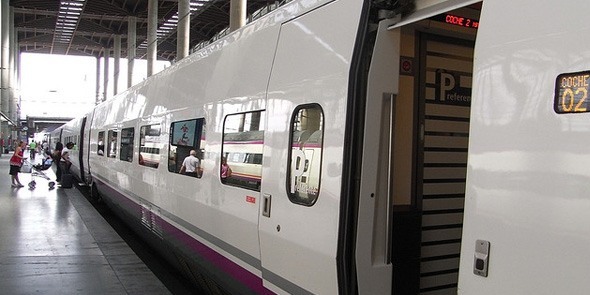 For more information on mainline trains, visit www.renfe.es.